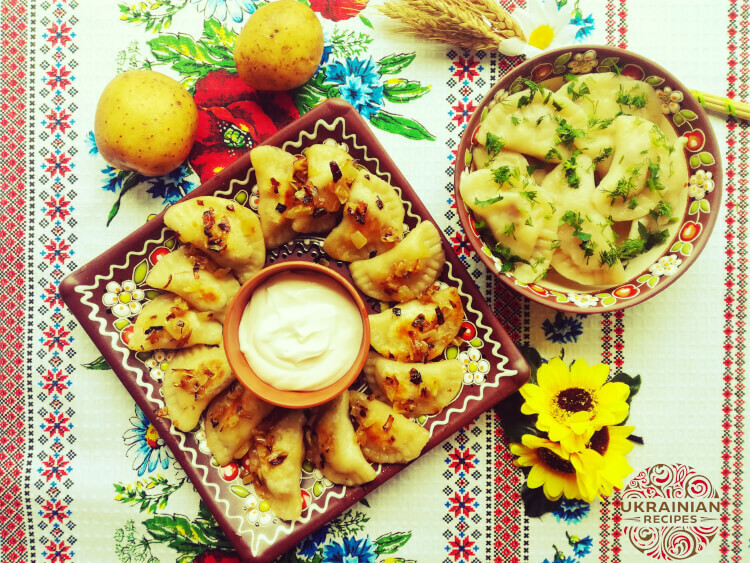 Ukrainian varenyky (pierogi) with potato are widely popular not only in Ukraine but also all over the world. People like this dish because it is simple, nourishing, and cozy. 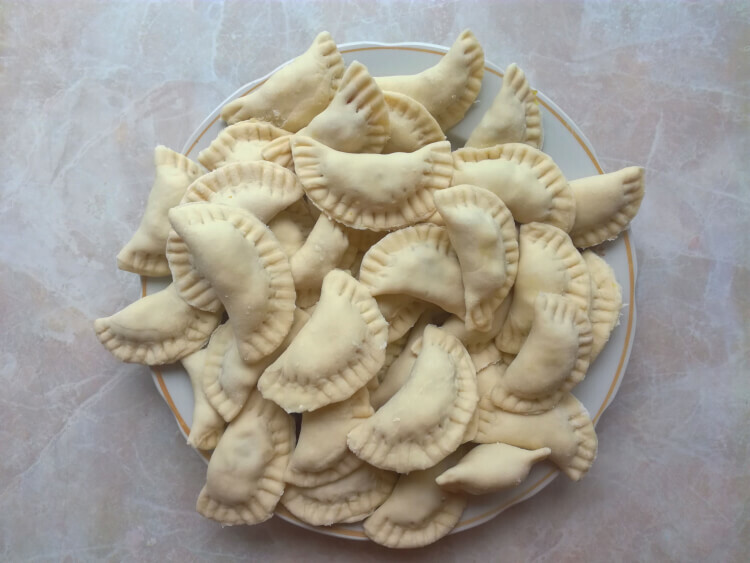 Pierogi are made from thin unleavened dough. Couple that with the potato-onion filling and you get a win-win combination. 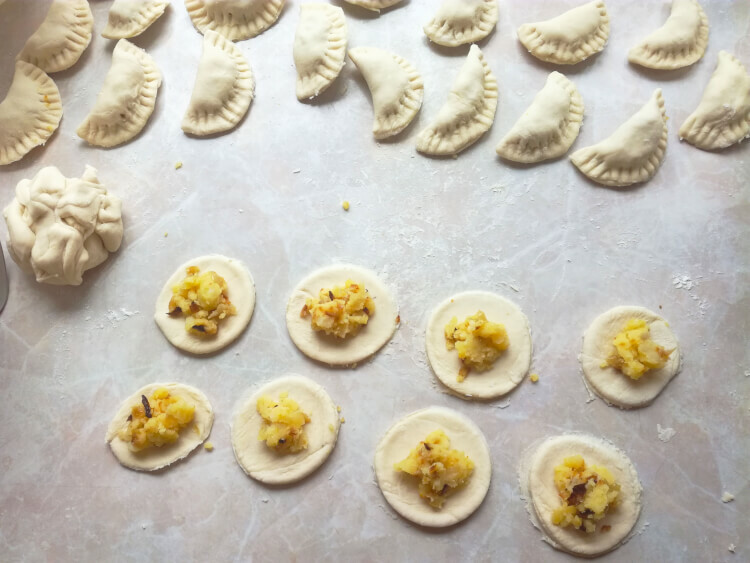 The key for good pierogi is the right dough – soft and elastic. And in this recipe, you’ll find the step-by-step instruction to get such a dough. Peel and wash potatoes. Cut them into chunks. Put potato in a pan. Pour water above and bring it to boil. Adjust salt and boil potato until done. Drain off water thoroughly and mash potato. 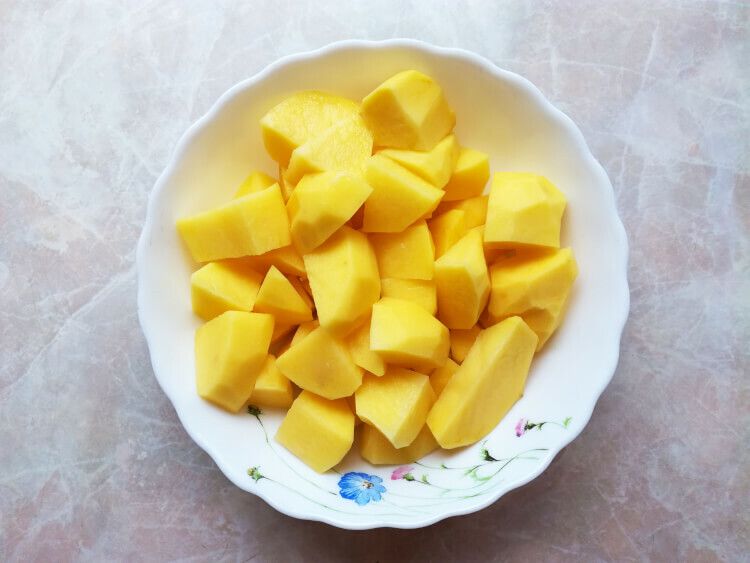 Set aside potato for a while (do not add butter, milk, etc – the potato filling should be dry). P.S. 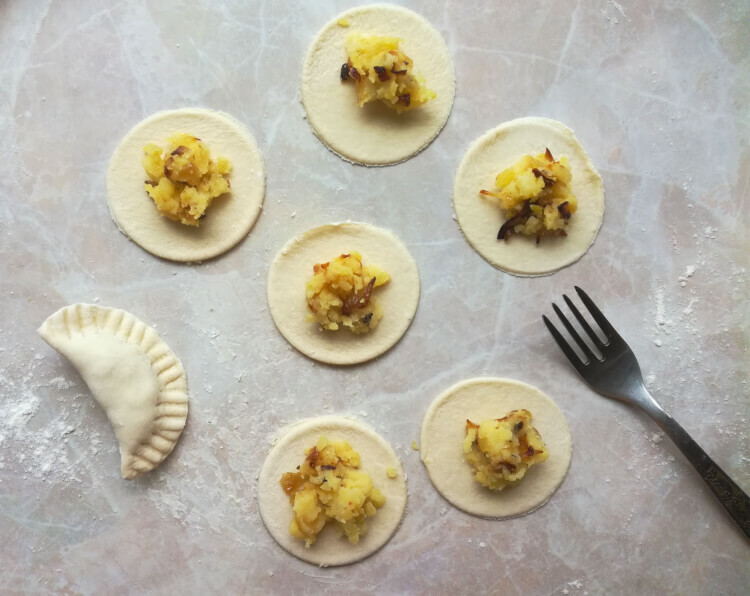 If you have leftover mashed potatoes, you can save some time and use them to fill your pierogi. Peel, wash, and chop bulb onions finely. 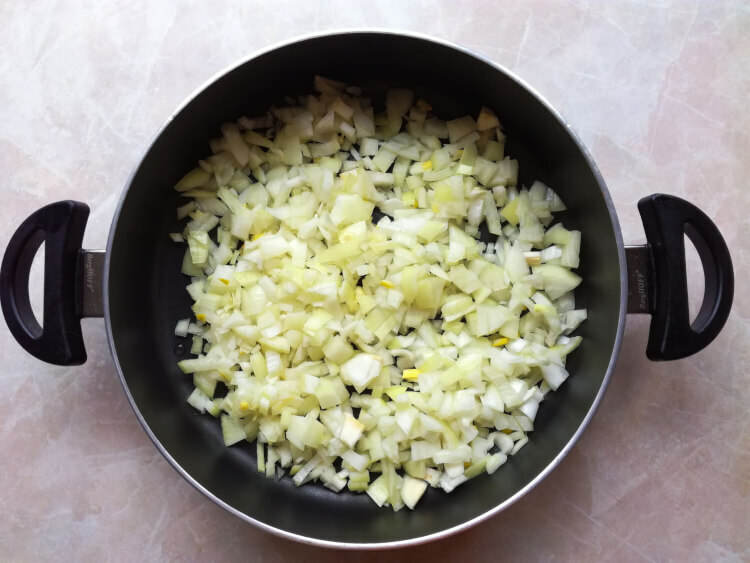 Preheat sunflower oil in a frying pan and golden brown the onions. Mix mashed potatoes with fried onion and add salt if needed (leave some onion to top the fried varenyky before serving). Pour 200 ml of warm water in a big bowl (the temperature of the water is a crucial factor). Put 1/4 tbsp of salt and stir to dissolve it. 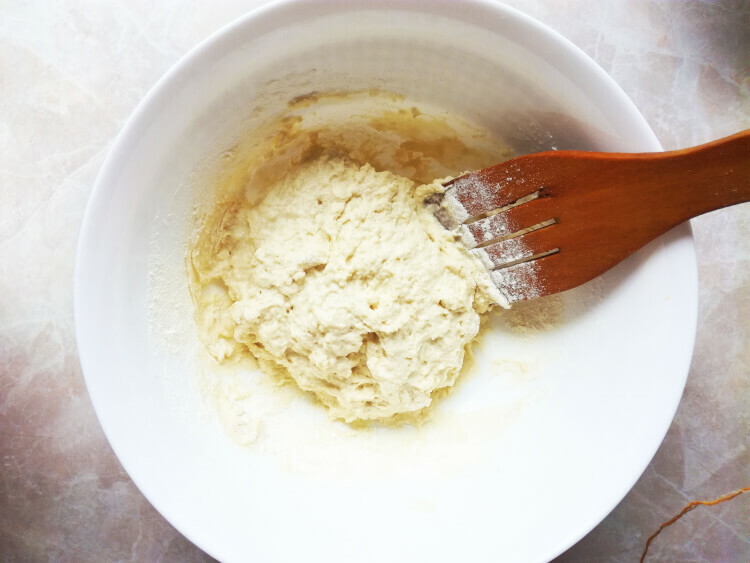 Add around 200 g (7 oz) of wheat flour and start to mix the mass with a wooden spoon. When the dough starts to come together, then top your table with flour and transfer the dough there. Dredge the dough with flour and start to stir the flour into the dough. Continue to dough, adding flour from time to time. 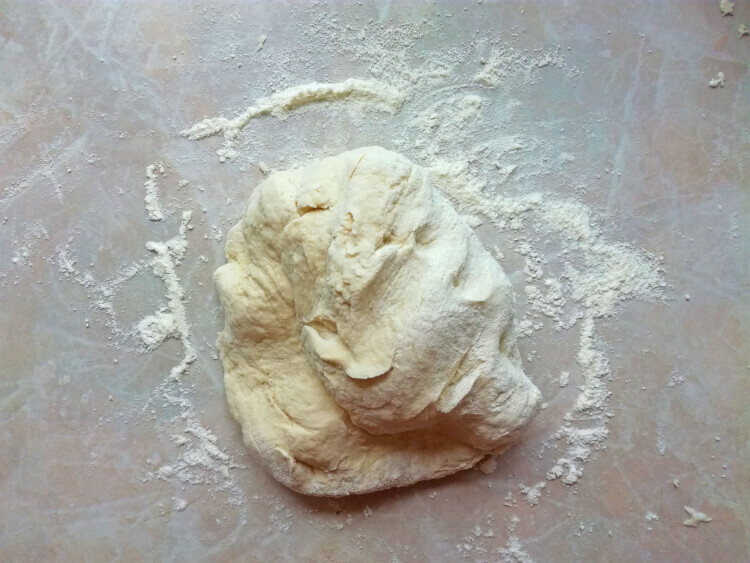 Knead the dough until it becomes elastic and does not stick to your hands and table. 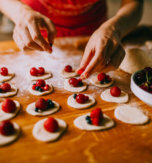 If you already have such a dough and have flour remained, do not use the remaining flour (flour differs from manufacturer to manufacturer – so you may need more or less flour than it’s mentioned in the ingredients). 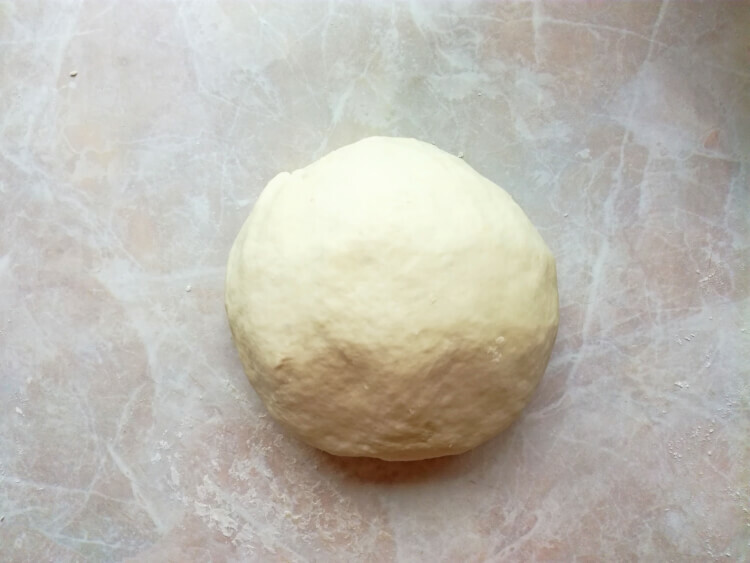 Cut out a small piece of the dough and roll it thinly (the layer thickness should be a bit less than 2 mm). You can also cover your rolling pin with flour. 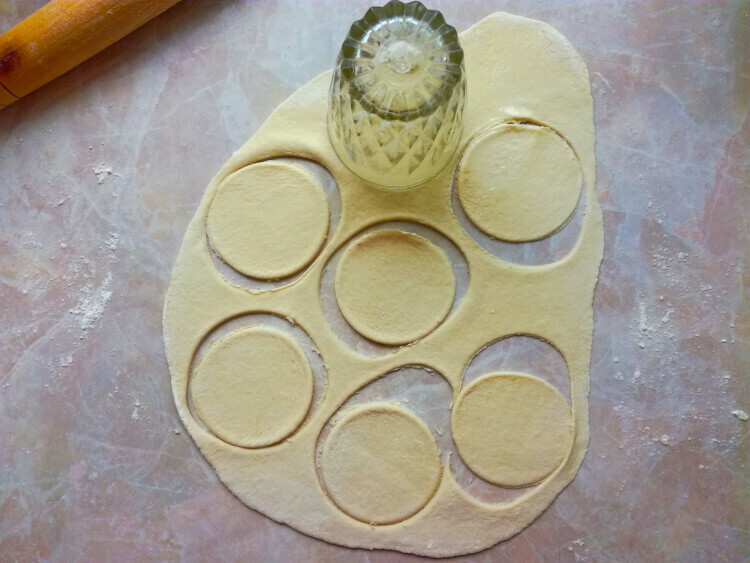 Cut out circles with a cookie cutter or simply use a glass. Add around 1 tsp of the potato filling above each round. Fold the dough in a half-moon shape around the filling and pinch the edges to seal. Press around edges with fork tines – to get a beautiful, ribby pattern. Repeat until you make all varenyky. At the end I had around 45 dumplings). Bring water to boil in a pan. Add varenyky and salt the water. 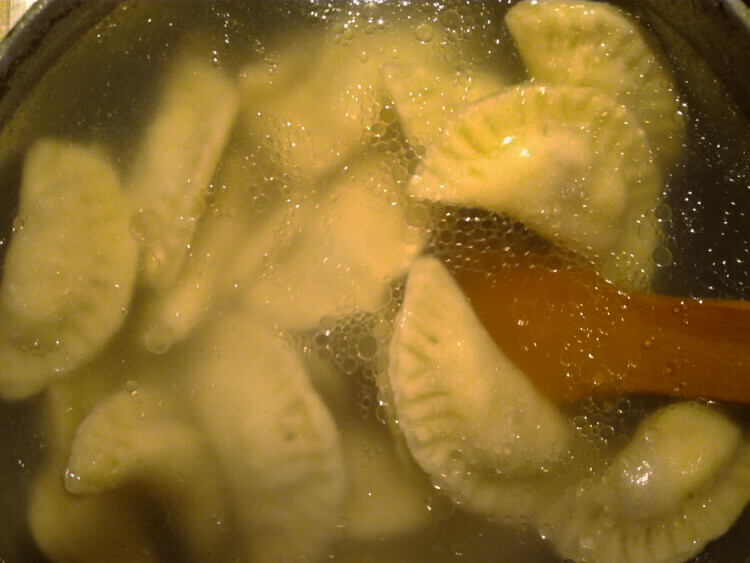 Boil them for around 5-7 minutes, stirring pierogi continuously to prevent them from sticking to each other. 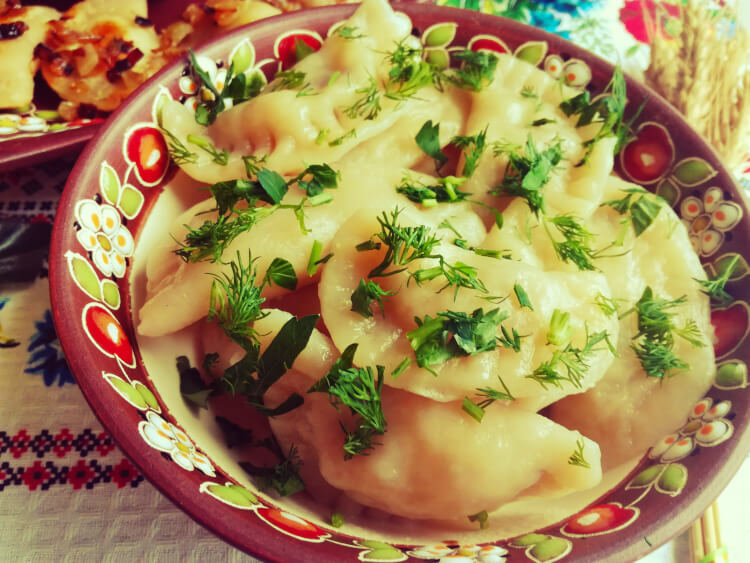 You can serve boiled varenyky and just transfer them to a plate with a slotted spoon, and then top dumplings with chopped dill and parsley. Or you can golden brown pierogi on a frying pan until crispy and top them with fried onion. 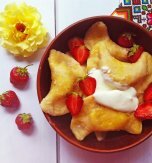 Serve varenyky with sour cream. 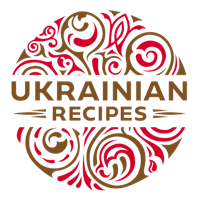 Have you liked the recipe for Ukrainian potato pierogi? 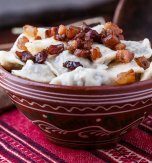 Traditional Ukrainian food. 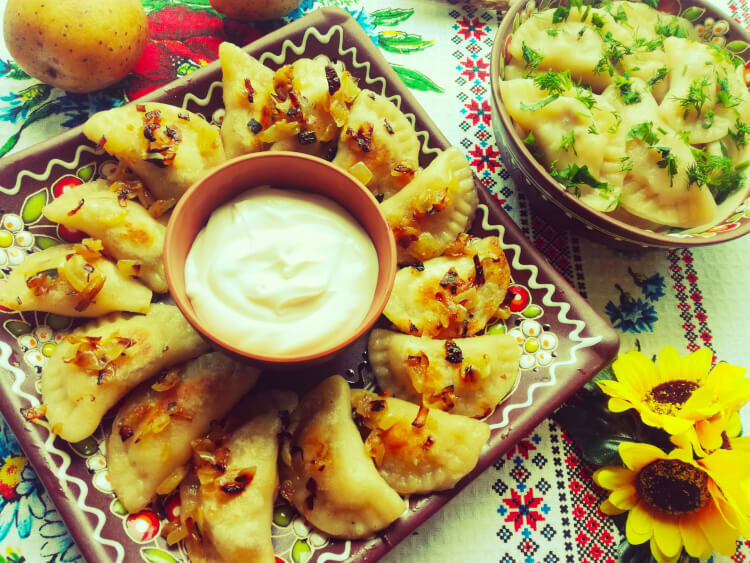 Have you ever wondered where varenyky (dumplings) came from?